It’s been a week already? Oy! First of all, a very happy birthday shout-out to my mum (who probably isn’t reading this, but you never know). Second, a hearty welcome back to Bookishima who posted last week about two play kitchens she’s building – an indoor one out of cardboard and an outdoor mud kitchen. Go take a look and cheer her on! And a big HOORAY! for reader Shlomit, who did a massive purge of her house and has made room, physically and mentally, for whatever comes next. You can do it too, you know. It’s amazing what the invisible peer pressure of the internets can spur you on to do. If you don’t have a blog just comment on this post like Shlomit did last week. You can even send me some “after” pictures and I’ll post them in a huge roundup-style WIP Wednesday post. And now, here’s my work. A cautionary tale for you: last Thursday I rode the bakfiets over to Lowes (which, incidentally, is a very hilly ride) to get lumber for this project. Aspiring trash-picker that I am, I checked out the bin next to the board cutting area and found some perfectly good white melamine shelving in there. Malcolm, the friendly associate, helped me pull out the pieces I wanted and proceeded to cut them to my specifications. When I asked how many cuts there were (i.e. how many I should pay for), he kind of shrugged and said “I dunno. Tell them five.” So for $5 I got over half the materials for my project. And once I was going with melamine fibreboard, I decided to stick with fibreboard for the other parts of the project too. Always predrill your holes when working with fibreboard. Otherwise it’ll crack, bulge, and splinter off. Cheap materials are cheap for a reason. Stick with wood. Good old wood! If everything isn’t perfectly square and level, the whole project just looks shoddy. So after building some crooked cubbies for the closet, I did what any self-respecting DIY-er should do… I started over again with the proper materials. Sort of. I salvaged some plywood from my parents’ garage and my dad spent an hour helping me with the ripcuts and general meaneuvering of a giant sheet of wood through his radial arm saw. It’s basically two shelves with grooves (or dadoes, for those who are inclined towards technical terms) for very thin plywood dividers. It’s not as nice looking as it would be with thicker dividers, but it was a sacrifice I had to make in order to fit three cubbies across. 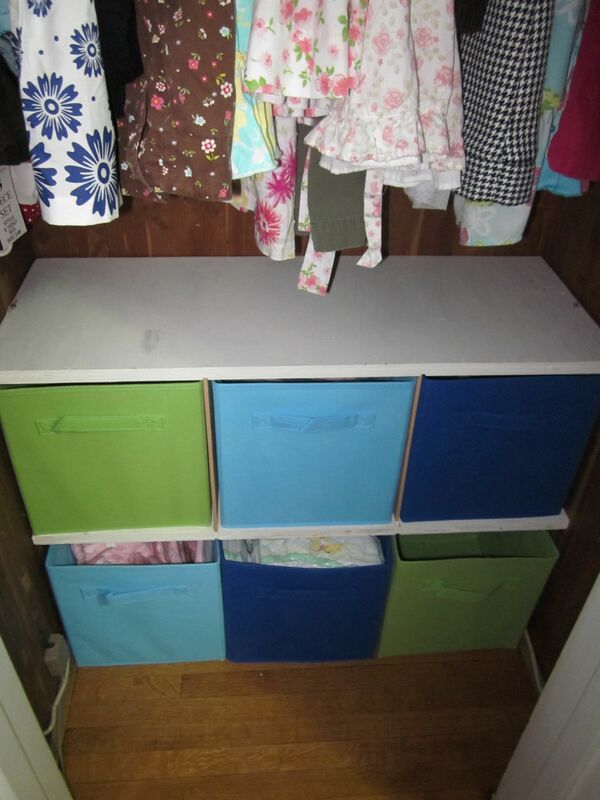 The fabric drawers are Closetmaid brand and were definitely the most expensive element of this project. I bought three different colours of drawers, one for each child. The drawers on the bottom hold extra diapers and the ones on the second shelf are for (current) seasonal items – sweaters in the fall, winter, and spring and bathing suits in the summer.The top shelf was supposed to just divide the fabric drawers from the hanging clothes, but there’s enough space above it right now for me to store some neatly lined-up shoes in there, or maybe socks and other accessories in small plastic bins. See that gaping empty space? 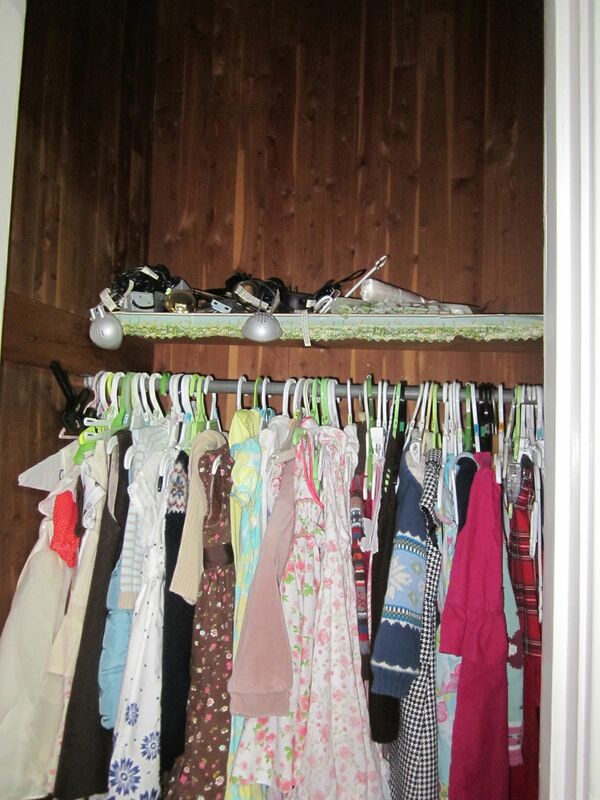 I can think of so many things that could be stored there: the kids’ towels, their bedding, receiving blankets, out-of-season clothes, even more extra diapers, “etcetera, etcetera, et cetera” (anybody know what movie I just quoted?). I’ve measured and I have just enough room to squeeze in three rows of three cubes each, so that’s my mission for this week… back to my parents’ house for salvaged plywood, I suppose. Completed (pretty much): Felt numbers! 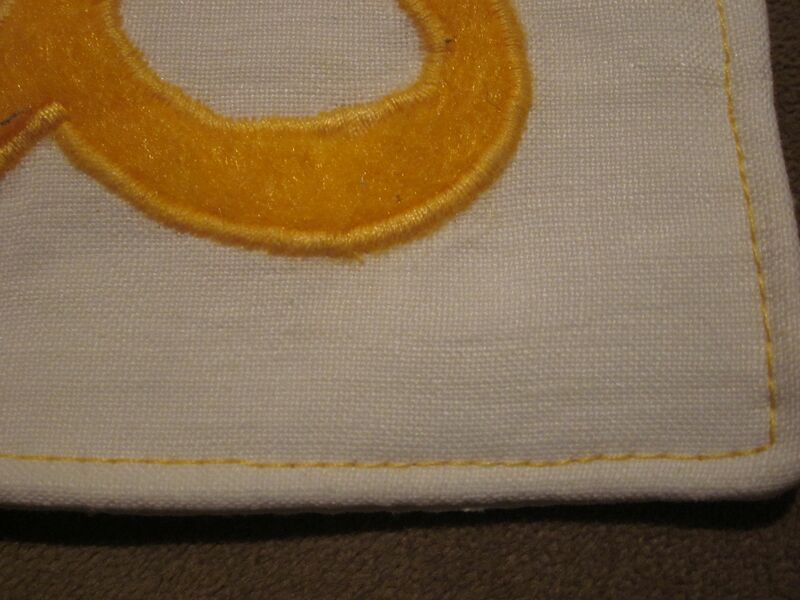 As you see in the close-up, the felt number was appliqued on with a satin stitch in matching thread, and I topstitched around the edge of the rectangle with the coloured thread as well. I still want to put up a dowel or a clothesline so that these can be functional as well as decorative, but for now I’m considering them done. K loves them! Bellies have been popping out all over, and I owe several baby gifts. This week I’ll be sewing at least one double-sided flannel blankie (with loops for toys) and one of something else… haven’t quite decided yet. A pretty blanket? A ball? A stuffed turtle? I’m taking votes and suggestions, so don’t be shy… comment! Aaand… that’s a wrap. 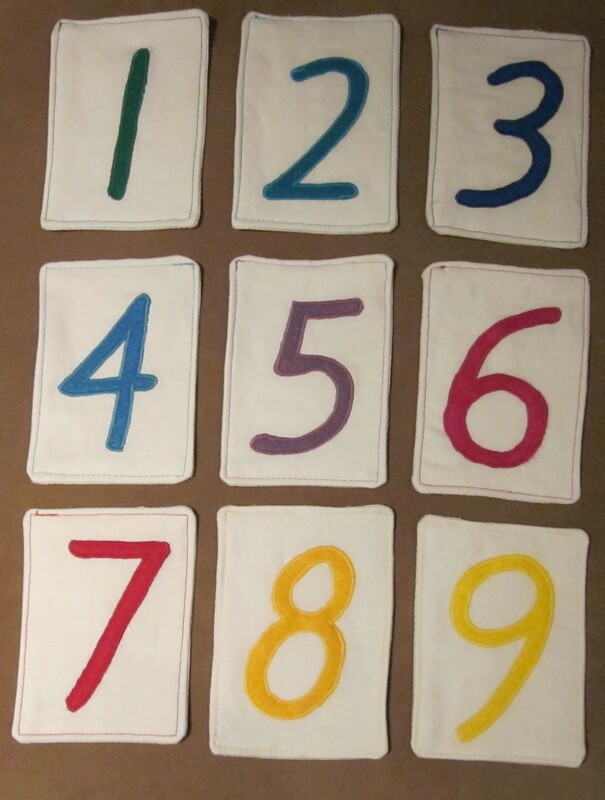 Tune in later this week when I explain why the montessori felt numbers only include numbers 1 through 9 (any guesses?) and post some other random stuff. Don’t forget to post about your own projects!